All nations benefit both economically and socially from having a well-educated and skilled population. Independent schools in Australia, through their high quality and their diversity, make a significant contribution to the national interest in having an educated and responsible citizenry. In a geographically dispersed and culturally diverse nation such as Australia, Independent schools play an important role in promoting social cohesion and harmony, by allowing families from different ethnic, religious and cultural backgrounds to choose schools which enable them to maintain their communities, within a frame of common social values. In Australia, the frame of common social values and shared goals for schooling are set out in the Melbourne Declaration on Educational Goals for Young Australians, endorsed by all state, territory and Commonwealth Ministers of Education in 2008. The Melbourne Declaration, developed as a collaborative effort involving all school sectors, provides an overarching framework for schooling that allows individual needs and aspirations to be recognised and accommodated within wider societal purposes. All Independent schools are committed to the Melbourne Declaration goals of excellence and equity in schooling and its aim for all young Australians to become successful learners, confident and creative individuals, and active and informed citizens. Independent schools subscribe to this broad view of the goals of schooling, encompassing achievement in a wide range of curriculum areas as well as the development of the skills, knowledge, attitudes and values students need to live a satisfying, productive and responsible life. In choosing an Independent school for their children, parents are influenced by a variety of factors. The main driver of school choice, beyond the desire of parents to match the school with the individual needs of the child, is the values and attitudes of the family. Other factors affecting school choice include religious affiliation, academic outcomes, quality teaching, a supportive caring environment, the physical environment and facilities, the content of the curriculum, quality leadership and extra-curricular opportunities. Values education is an important part of school life and culture in Independent schools, most often linked to the religious affiliation of the school. In Independent schools, civic and religious values are specifically encouraged and developed in students through social justice and community service programs. These include fundraising to meet community, national and international need; volunteering in community services such as soup kitchens and opportunity shops, and in earth stewardship projects such as environmental clean ups and heritage protection; helping out at camps for young people with disabilities; assisting with aged and frail people; participation in school inter-faith projects; and linking with community organisations such as Amnesty International. Australian Bureau of Statistics data shows that Independent school students have a high level of commitment to volunteering and civic engagement and that families are attracted to the strong communities and supportive environments they find in Independent schools. As a condition of government funding, as well as committing to common public goals for education, Independent schools are engaged in the implementation of the Australian Curriculum, developed under the auspices of the Australian Curriculum, Assessment and Reporting Authority (ACARA) and they participate in the National Assessment Program (NAP), the measure through which governments, education authorities and schools can determine whether or not young Australians are meeting important educational outcomes. 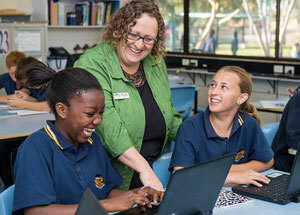 The National Assessment Program includes literacy and numeracy testing (NAPLAN) and three-yearly assessments in Science Literacy, Civics and Citizenship, and Information and Communication Technology (ICT) Literacy. Through these commitments and by satisfying other extensive registration, reporting and accountability requirements, Independent schools remain fully accountable for meeting the public purposes of schooling. They work to achieve the high quality educational outcomes on which national prosperity depends and to promote the social cohesion, tolerance and civic-mindedness which support democracy and the well-being of society as a whole.